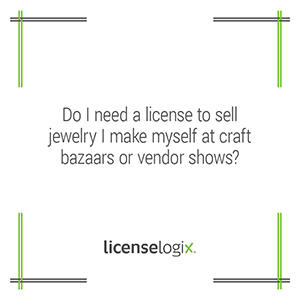 Do I need a license to sell jewelry at craft bazaars or vendor shows? Yes. You must have a General Vendor license if you plan to sell, lease, or offer to sell or lease goods or services in a public place in New York. If you will only be selling merchandise from a booth or stand at an authorized street fair (e.g., street fair, block party, or festival), you must obtain a temporary Street Fair Vendor permit to sell merchandise at an authorized street fair. Some exceptions do apply, for more information you can reach us at (800) 292-0909 or click live support to speak to a licensing expert online now.